Climate change is slowly making parts of Antarctica turn green. New species of plants and insects are taking hold, threatening to transform the continent’s delicate ecosystem. This article originally appeared on PRI’s The World. The typical image is that of a pristine, white wilderness of ice and snow. “The white of the snow, the brown of the rocks, and the blue of the sky is a perfect day on the Antarctic Peninsula,” says researcher Dominic Hodgson of the British Antarctic Survey. But Hodgson says there is increasingly a new color: green. Hodgson is a frequent visitor to Antarctica, especially the Antarctic Peninsula and the surrounding islands. The Antarctic Peninsula is that thin piece of land that snakes north from the icy continent toward the southernmost point of South America and Cape Horn. “We’re witnessing the retreat of ice, certainly along the Antarctic Peninsula, at a pace that you can see the change from year to year,” explains Hodgson. In place of the ice, moss is spreading. 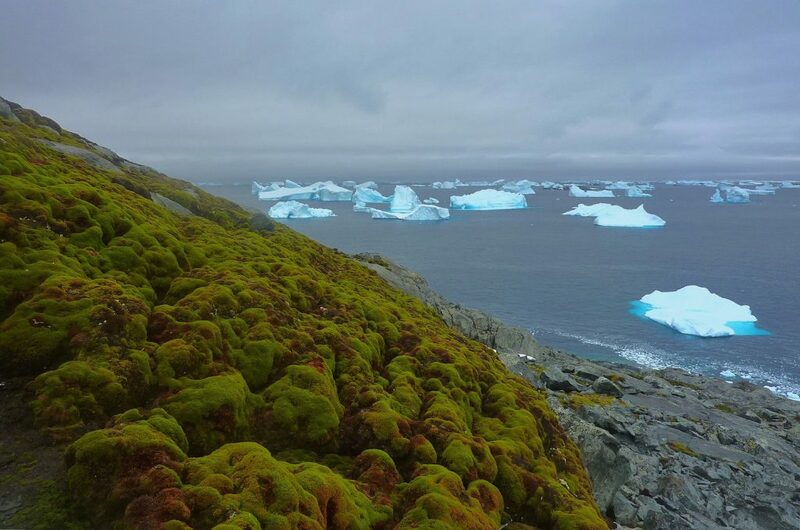 Moss has long been present in Antarctica, but scientists are struggling to prevent certain types of meadow grass from getting established. Being a scientist, Hodgson and his colleagues have taken careful measurements of the moss growth, and their findings are published in the journal Current Biology. The growth has accelerated from about one millimeter per year to a maximum of 13 mm per year. That’s a long way from being able to support agriculture, jokes Hodgson. “Any crop growing at that kind of rate is unlikely to sustain a business,” he says. Houseflies are also poised to become established, posing a major hazard to wildlife as they can be vectors for pathogens. But even the spread of different kinds of moss can endanger an isolated patch of unique ancient growth. Much flora and fauna in Antarctica and the surrounding oceans are uniquely adapted to the harsh environment there. And so, they’re vulnerable to minor changes in that environment. Hodgson says, unfortunately, humans are the main source of these invasions. “We all travel around wearing clothes that are often clothes that we’ve worn elsewhere in the world, back at home. But also things like camera bags, which we take on holiday with us but rarely ever clean.” Clothing and equipment like camera bags can carry unseen little seeds and propagules. It’s not just the Antarctic Peninsula that is dealing with these alien invasions. Hodgson says wherever people go on the continent, there are now problems. Christopher Woolf is a news editor for PRI’s The World. He has worked in global news since 1986, and has reported for the BBC from places like Afghanistan and southern Africa. For the residents of this island nation, climate change is already here. A new study suggests a melting Antarctica could pump up global sea levels much more than previously predicted.